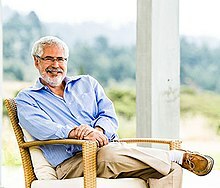 Steve Blank (born 1953) is a Silicon Valley serial entrepreneur and academician who developed the Customer Development methodology that launched the Lean Startup movement. He authored The Four Steps to the Epiphany and The Startup Owner’s Manual to describe how to build a successful company. Customers don't ask to see your business plan. Not All Who Wander Are Lost, K&S Ranch, 2010, p. 40. While there is an occasional bad apple, the public market rewards companies with revenue growth and sustainable profits. Steve Blank, Not All Who Wander Are Lost, K&S Ranch, 2010, p. 54. Confusing testosterone with strategy is a bad idea. Business Insider "You're Better Off Being A Fast Follower Than An Originator", October 5, 2010. 80% of success in your career will come from just showing up. The world is run by those who show up…not those who wait to be asked. Philadelphia University Commencement speech NPR: "The Best Commencement Speeches, Ever". May 14, 2011. Innovation comes from those who see things that other don’t. Founders are truly artists – they see something no one else does. Fortune "Entrepreneurs as dissidents". November 6, 2012. Entrepreneurship is an art, not a job. Forbes "Entrepreneurship is an Art Not a Job". March 29, 2013. Founders fit the definition of a composer: they see something no one else does. And to help them create it from nothing, they surround themselves with world-class performers. In Silicon Valley, we have a special word for a failed entrepreneur – it’s called experienced. University of Minnesota commencement speech, FounderLY. May 06, 2013. A founder's skill is knowing how to recognize new patterns and to pivot on a dime. At times the pattern is noise, and the vision turns out to be a hallucination. "Vision vs. Hallucination", Entrepreneur.com, 30 Aug 2012. Entrepreneurs are artists and I mean “artists” in the true sense of the word: they see something no one else does. Steve Blank in interview with Jake Cook, "Steve Blank: Lessons From 35 Years of Making Startups Fail Less", U99 website, 2013. Strategy Is not a to-do list. Entrepreneur "Strategy is Not a To-do List" October 16, 2014. There are no facts inside the building, so get the hell outside. Forbes "Try 'Walking The Path' To Solve Your Startup Problems". October 27, 2015. To predict the future, 1/3 of your team needs to be crazy. VentureBeat "‘Blank’s Rule’: To predict the future, 1/3 of your team needs to be crazy". December 19, 2015. Young entrepreneurs tend to be fearless and have no respect for the status quo, and that’s exactly what you need in an environment where the status quo is going to put you out of business. Forbes "Lean And Meaningful: What Founders Still Need To Fix In The 21st Century". February 29, 2016 issue. Don't believe your own b.s. It's real easy to confuse funding with success. When I was young, I learned a quote in Sunday school that has stayed with me throughout my life. It said, 'teach us to number our days that we gain a heart of wisdom.' * Most of us will wake up 28,762 days- and then one day - we won’t. That means you have about 21,000 days left - and about 14,000 of them for your career. So herein lies the urgency. NYU Commencement Speech, "Steve Blank to Millennials: 'Make the Days of Your Life Matter'", May 23, 2016. Mentorship is a two-way street. While I was learning from them [brilliant mentors] - and their years of experience and expertise - what I was giving back was equally important. I brought fresh insights and new perspectives to their thinking. "Speech at New York University's Tandon School of Engineering," at huffingtonpost.com, posted 05/24/2016. "Build it and they will come” is not a strategy; it’s a prayer. Forbes "How To Test The Assumption That People Actually Want Your Product". June 14, 2016. We used to pivot by firing people. Now we fire the hypotheses. Startup Grind "70,000 tests later, Steve Blank knows how your startup can fail". June 15, 2016. Progress and stability are mutually exclusive. Number one is "Do you have curiosity?" Number two is "Does it translate to imagination?" But number three is "Did it translate to action?" That’s the difference between someone with an idea and someone who is an entrepreneur. A startup is not a smaller version of a large company. A startup is a temporary organization in search of a scalable, repeatable, profitable business model. On Day One, a startup is a faith-based enterprise. Relentless execution without knowing what to execute is a crime. In a startup, founders define the product vision and then use customer discovery to find customers and a market for that vision. If you're afraid to fail in a startup, you're destined to do so. Market type influences everything a company does. Startups demand comfort with chaos, uncertainty and change. No business plan survives its first contact with customers. Only because earlyvangelists are buying into your total vision will they spend money for an incomplete, buggy, barely functions first product. The best startups discover a situation where customers have tried to build a solution themselves. The answers are easy. Asking the right questions is hard. Winners understand why customers buy. Building your product is easy. The hard part is getting customers. Change engenders resistance, and resistance creates saboteurs. Steve Blank, The Four Steps to the Epiphany, K&S Ranch, 2013. Customer Discovery is damn hard work. You can't fake it. A startup is in reality a 'faith-based enterprise' on day one. To turn the vision into reality and the faith into facts (and a profitable company), a startup must test those guesses, or hypotheses, and find out which are correct. Money is the lifeblood of startups. You stay in business until you run out of it. Tablet Magazine "Tikkum Olam in Silicon Valley". May 06, 2013. Great entrepreneurs are revolutionaries. They speak truth to power. They change the status quo. They rebel against what exists. If you want to see what country will create the next Steve Jobs or Elon Musk, see how they treat their dissidents. The Silicon Valley entrepreneurial culture used to be limited to a few entrepreneurial clusters. Now the Internet has spread that culture everywhere. There are several generations of Silicon Valley CEOs who "pay-it-forward." It’s an understood, underground thing you don’t talk about. You give back to younger founders and entrepreneurs without asking for anything. The goal is to pass on what we learned to make our startup ecosystem better. The #1 change in Silicon Valley is information density. If you think about it, 30 years ago the only way you got info was during one-on-one meetings. You knew very little and the world knew very little. We just know a lot more now. The Silicon Valley culture is "I can win and you can win" - it isn't a sum-zero game. "Steve Blank: Dark Age or Enlightenment? It's Up to the Future Generations", Inc.com, June 1, 2017. I’ve watched how, in a blink of an eye, technology went from products used by the very few, to ending up in the pockets of billions, bringing social change and corporate disruption. Only a few generations have been granted the role of determining whether a revolution in communication will allow our better angels – or our darker angels – to win. You leave here with incredible opportunity, but also with immense responsibility. Will you let darker angels win as you add fire to the flame, or will you seek out and spread real news? The question is whether you'll tell your children that this decade was the beginning of a new dark age, or whether it was the time of something new and wonderful. Light a path for the better angels. The world is counting on you.